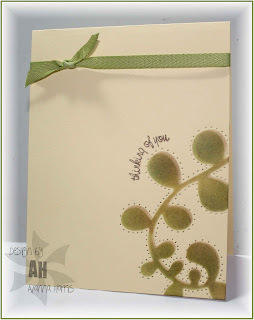 I cut out a stencil using the negative part of the Vine die from Sizzix. I used 3 different inks to sponge the shape onto my card base...red & green first, then I moved the stencil over slightly and sponged brown to make a shadow. I added piercing around the sponged vine which made it look quite dimensional considering it's a one layer card. The clear sentiment curved easily on my block to follow the shape of the leaf, and a thin ribbon completed the card. Monochromatic brown with a smidge of red...I love Kraft cardstock, so I had to use it for this card. I also recently splurged for some PTI rustic white cardstock which is, well, rustic! It has bits of natural flecks and fibres in it. AND I just received my order of new A muse fall stamps. When I thought about the smidge of red, I knew I should use the tiniest apple from the School Time set. 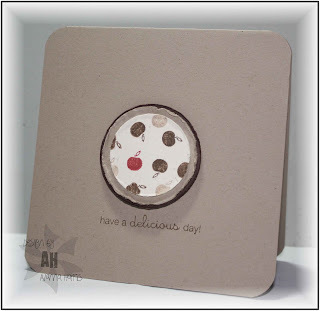 I stamped the apple repeatedly in brown, did a few in brown stamped off once, then added one red apple in the mix. I used my SU circle punches and a circle nestie to make the main image and its mats. I roughed up the edges of the circles a bit, popped them up on dimensionals and stamped the sentiment below. I was inspired by he disposable coffee cups at work. On the side of the cups, the logo of the coffee company is in red and the name is centered below in brown, and I've been wanting to use this design idea on a card for awhile now...I love its simplicity! My new A muse purchases from the fall release are awesome...love the school lined cardstock and all the new stamps! I used primary colours and black for some contrast/to tone down the loud yellow base. The wider edge at the top of the lined paper fit the line up of school kids perfectly. I used the SU spiral punch on the left margin of the paper, and matted it in black. I was originally going to place the main image diagonally across my card, so I added a notebook line ( from the clear School time set) stamped in versamark diagonally across for some grounding of my main image. Once I placed it on the diagonal, there seemed like too much "white" space, so I ended up putting the main image on straight. I still like the subtle diagonal underneath...the adorable sentiment from the School time set completed the card. Whew...marathon post! Be sure to check out all the amazing submissions for the design team! Thanks for visiting!! 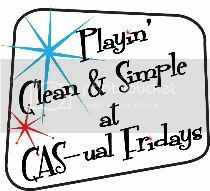 Great job on all of these Alanna - clean, simple and fantastic!